So, not always do I get out to facilitate a corporate event but this team building activity was one of them. I had gone to see a prospective client after having a lengthy conversation over the phone. He was looking for a team building company who he could trust to deliver a memorable team building event. As I expect most companies to do, he had looked at a couple of team building companies. He too had set up his IT recruitment business years ago as I had with Team Tactics, so we had a bit to talk about. So I suggested that I come with my most brilliant Drum Master/rhythmic professional along to his offices to totally WOW him. The meeting took place the latter part of last year and quite frankly, we blew the competition out of the window. Mark our Drum Master and supremo anything musical, explained how we do it and why we do it better than others. We discussed the whole conference and how the team building elements would fit in to the business messages that our client was wanting to convey. 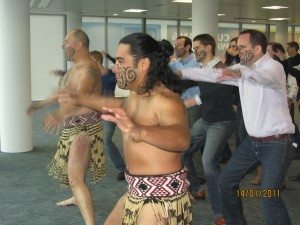 We suggested The Haka as an energiser in the morning where we could storm the room to the surprise of the group. 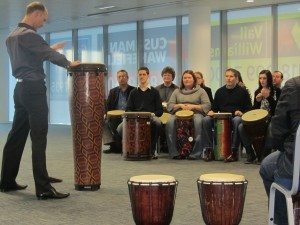 In the afternoon we would run a drumming session to bring further messages into the overall day. Well the day arrived last Friday and I felt I should be there to see it to the end and hopefully a very happy client. Actually I was just the official photographer on the day so my abilities are transferable thankfully! Any event manager will tell you that being an event manager can be a long day. This certainly was this. The Maoris arrived on site at 7.30pm, Mark arrived at 8am and me 8.20am…I had further to come is my excuse! I found it fascinating to learn more about the Maoris we use. They are the real deal. So much so in fact that these guys live all together in one house (16 of them) and there is a definite hierarchy with Elders the most important person/s, often who are women (quite right!). Our Maoris are from the tribe who many years ago wrote the Haka for the New Zealand Rugby Team. How cool is that?! The Maori’s are a fascinating ‘tribe’ with their own language, distinctive crafts and performing arts ie The Haka, and a tribal society with a prominent warrior culture. So put this in front of conference goers and you have dynamite. Dressed to kill, looking exactly what they are, they are totally transfix the audience with their powerful Haka. As described by Wikipedia this is a posture dance with alot of shouting and stamping of the foot!! Do look on our new facebook pages for lots of photos and video footage to see how all the boys and girls got right into the spirit. Well it was a dynamic drumming activity that culminated in everybody leaving the conference with their own take-home drum. Hopefully this is a good memento and memory of the day, where everybody in the office came together to create something amazing. A real good feel factor and a classical energiser for any conference. Thanks to everyone, I will load some photos on tomorrow! I just wanted to drop you a quick note to say thank you for bringing yesterday together. Both events totally exceeded my expectations. I was so impressed with the way the Haka took the time to get a briefing from Alex and the combination of sincerity and humour was spot on for our lot. The Drumming was also amazing, he had total command over everyone for two hours, a skill that we wish we could learn!!!! I was worried that the length of time might have been too much at the end of the day but the gusto and energy he puts in is so infectious I need not of worried.